I’ll be honest. I didn’t know what to write about this week. I considered several times writing to Charles Fischer and the editors and letting them know I was out of ideas, out of articles, I could write no more, I needed a break. All told, I’ve put down five articles of more than 1,500 words each since early September and had a lot of fun doing it, but I just didn’t feel as if I had another good idea that I could write about. So, I’m taking a mulligan this week and I’m just going to write a little about everything I can think of, and hopefully, in two weeks something else will come to mind. Otherwise, I might crawl into that special hole reserved for writers who can’t think of anything to write about. I grew up in Eugene, it’s my home town. I skateboarded and took the bus all over. Spent time downtown before the Valley River mall killed it, spent time at Halley’s Comet playing video games, grabbed a slice at Sy’s, hiked the Buttes, floated the river and learned to drive in Autzen’s parking lot. Even though the population has been more than 100,000 for a long time and the town is quite spread out, it still has that small town feel, that sense of community, of neighborhoods, of character. 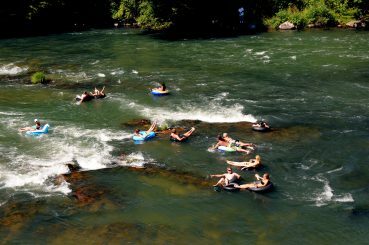 Floating the river in Eugene. 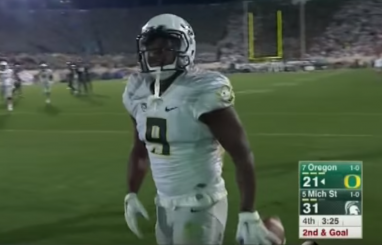 Eugene has always (it seems) had Nike, the University of Oregon, plenty of natural beauty, and decent weather even, but no big claim to fame, nothing much to rally around, no central theme that gives most that proud glint in their eye when talking about home — until the Ducks started winning, that is. I’ve written about this before so I won’t belabor the point, but really the last 20 years have largely been about winning in Eugene. A few hiccups along the way but mostly wins and bowl games. The last seven seasons lacked only a national title win in terms of establishing the dominance of the program. But why does it matter? Why do a few college football players, most not even from Oregon, playing and winning, mean so much to this town? First, I have to say, I believe it was about overcoming the stigma of being a perennial loser. Digging ourselves out of the cellar of Pac-10/-12 football, one season at a time, beating those teams that dominated us for so long (thank you coach Rich Brooks and coach Mike Bellotti). That was step one, and maintaining it was step two. Rich Brooks and Mike Bellotti brought us out of the football dark ages. That came over the past seven years, going 80-14 from 2008-2014. This is when we found that glint in our eyes, when we talked with pride about our city and our team. Not just winning but dominating. Overcoming challenges to stay at the top of the Pac-12 for seven straight seasons. Always innovating and smirking at defenses that flailed hopelessly as the Ducks ran by them. 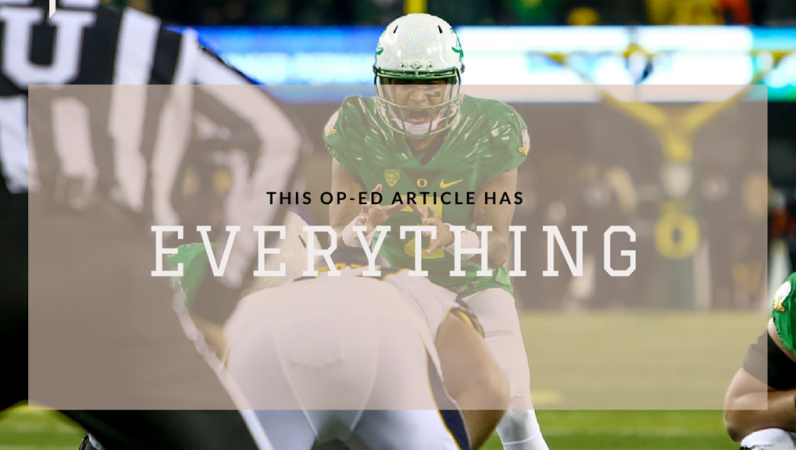 Being different: the Duck offense, the Duck coaches, the Duck uniforms, the Duck fan videos (“I Love My Ducks!”) and the Ducks’ small stadium with the big noise. It’s about taking what others thought was just above average (Marcus Mariota was a 3-star rated recruit) and making it into something remarkable. Oregon has a few highly rated recruits each year sure, but they’re about taking good and making it great. It’s about blue-collar work ethic becoming NFL draftee. It’s about grinding one day at a time and not taking anything for granted. And I think that’s why Oregon fans are so proud of the Oregon Ducks’ football program. The journey that has led us to today has been about overcoming so much to become something more than our individual selves. It’s the overcoming part that makes us what we are. 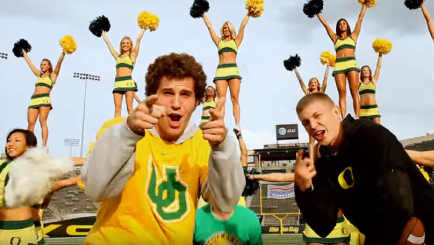 And I say we on purpose, because the Oregon Fan is part of Oregon Football. Let’s be honest. We all had great hopes, but no one really knew what to expect when Vernon Adams played his first game against Eastern Washington. He practiced for two weeks and won the starting job. How is that possible? 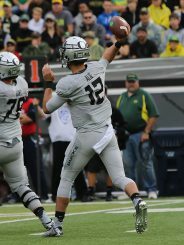 I think once that Jeff Lockie and Taylor Alie started playing we knew why. Even if he knew just one-tenth of the offense, Adams was better. He’s that good. I’ve always assumed it takes a couple of years of practice for a Duck quarterback to learn the system, and then a few live games to just get comfortable in it. Adams still probably doesn’t know all the plays at this point, and the finer points of the read option maybe aren’t there yet, but he’s still that much better. Vernon is short, but he’s crafty, and he’s quick. He’s not going to outrun a lot of people like Mariota or Alie, but he’s got the quickness to elude, buy time, and find receivers downfield. A healthy Vernon Adams behind center has made a huge difference. Like my claim in a previous article that the Blount punch was a good thing, because it meant we started using LaMichael James and Kenjon Barner behind a very green O-line, a new offensive line can be huge. We needed crafty and quick in 2009, not big and strong. And early in this season, we needed crafty and quick, not big and tall. As I said on Twitter during the California game, Vernon manages to both terrify and thrill me on nearly every play. Will he get sacked for a million yard loss or find someone deep for a TD? Thus far he’s taken very few sacks and has been finding lots of people deep. My finger nails have suffered but the win is all that matters, and Adams’ crafty feet and big arm are making it happen. College football isn’t college football without the venerable “what if” game. What if Vernon hadn’t take an illegal shot from a former teammate in the first game of the season and broken his finger? I’ve been playing tackle football for 20 years, usually at quarterback. I’m not good, but I can relate to playing with bad digits. It’s really hard to throw the ball when any of your fingers are ailing, even just a single knuckle sprain from getting jammed. Adams broke his pointer finger which puts the final touch on every throw. So, let’s imagine there was no illegal hit, and Adams doesn’t break his finger. What might have happened? We just needed one more touchdown to Byron Marshall to beat MSU. First, we have to admit that Adams’ finger hath no bearing on our young O-line or secondary; those remain constants. So, what we’re talking about is outscoring people. With two minutes left in the Michigan State game, Adams saw Byron Marshall running free down the left side and lofted it up for the go-ahead touchdown. Only he probably overcompensated for his finger and simply put too much arm into it. It was about five feet too far. That’s just one play. Imagine Adams as you’ve seen him lately, leading the Ducks to a bundle of points. Do you really think Oregon would have gone 43 MINUTES AND 40 SECONDS between scores by the offense? After scoring on the opening drive (in 3:50), they didn’t score again on offense until the 12:20 mark of the fourth quarter. Egads! Imagine one other touchdown drive and one other field goal drive during those 40 minutes. Entirely plausible with a healthy Adams, and it would have meant a relatively easy win that day, and a move into the Top 5 in the rankings. Utah is a different beast altogether, but I can certainly imagine it would have been much closer with a healthy Adams at the helm. Maybe we still have those breakdowns on defense and special teams and lose by a couple scores, but anything would have been better than losing by 40+ points. Utah took Oregon football and stuffed it down their throats. They played the Duks’ game, they used Shock and Awe, they destroyed the Ducks just about every way you can. So let’s be honest and assume that even with Adams starting, the Ducks still lose that game. Then Washington State comes to town. They’ve improved, sure, but they are still the ‘Cougs, and we’re playing at home. I know the Oregon defense was what it was, but they only really needed one more score to end this game in regulation and Adams certainly would have given us that. The backups couldn’t get a win versus Washington State. The carousel of backups was literally depressing to watch. I felt as though I needed professional therapy after that game. We were playing terrible and we lost in overtime at home! They just needed to play a tiny bit better at any number of points throughout the game to get that win. Ugly wins are still wins and with a healthy Adams, that would have been a win. Then they beat UW (12 years in a row and counting), ASU, Cal and they’re 8-1 and ranked in the Top 10 coming into the game vs. Stanford. In that scenario, even if they lose to Stanford and USC, and then beat OSU, they’d be 9-3. A very respectable season given how much we had to replace and looking at who they theoretically lost to (Utah, Stanford, USC). And if they beat either Stanford or USC, they get to 10 wins, their eighth straight 10-win season! That is my “what if,” my look at what could have been but for one illegal hit, one broken finger. Melancholy. The Oregon offense revolves around speed, misdirection, read option, play action, blah-blah-blah. WRONG! 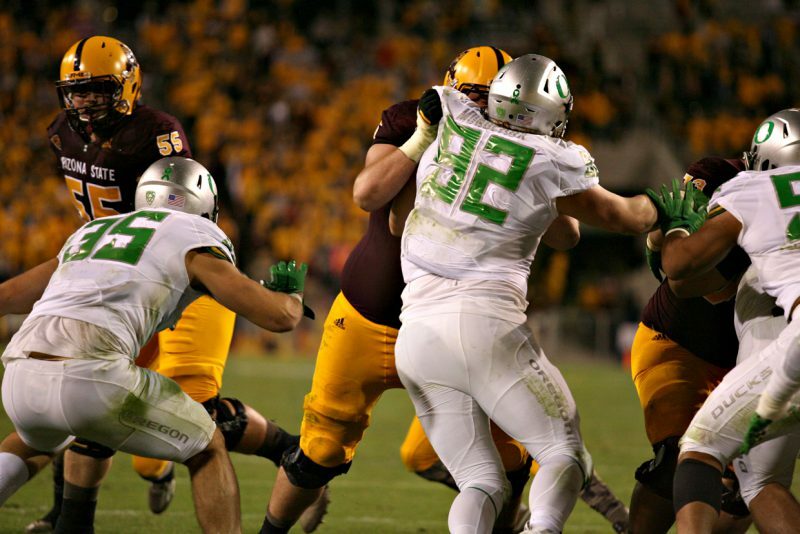 The Oregon offense starts and ends with blocking! First basic tenant of football: You have to have good blocking on the O-line. QB’s need time to make decisions, running backs need holes to run through. This can be mitigated to some degree with a mobile quarterback and a fast backfield, but you can only hide so much. My personal belief as to why the Oregon offense dominated over the past seven seasons relates not to speed, misdirection, read option, play action, Chip Kelly’s play calling, Mariota, etc. My claim is that the Oregon offense was better than everyone else because of downfield blocking by its receivers and running backs. It all starts with blocking. 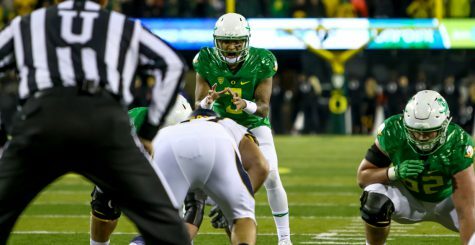 Why was Oregon’s offense so prolific? Yards after catch, my friends. Many times we wondered why receivers weren’t getting more playing time, and according to what we heard from coaches, ability to block and aggressive blocking during the week at practice played a big role. Jeff Maehl and Levasier Tunei are skinny guys, but they loved to find somebody and push them to the whistle. Bralon Addison and Keanon Lowe have at times been known more for their blocking than their receiving. Josh Huff was a beast (and still is, see final play of Monday Night Football on 11/9/15) at blocking. All of these guys could run and catch and score plenty, but what set them apart, and what sets the Oregon offense apart, is downfield blocking. So, the next time you’re talking about Oregon football, pause, take on a professorial look, and tell your friends about the real key to the Oregon offense, blocking.